This morning, as soon as I woke up, I heard the birds singing. 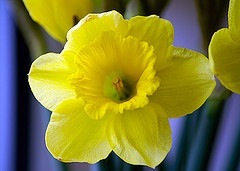 I opened the curtains and saw the daffodils blooming. Homes are flying off the shelf! Throughout the past few weeks, while helping several buyers make offers on their desired properties, I noticed that there was barely any time to make an offer before homes went under contract. But this was anecdotal evidence and I wanted to know if this was happening across the entire Fairfax County Real Estate Market. But how fast are they really selling? Can it get any faster? Is a Days on Market (DOMM) of 5 slower than 1 or 2? Not really. The main reason why the average days on market (DOMM) is 5 and not just 1 or 2, is that most sellers wait through a weekend before choosing an offer. By activating a listing on a Thursday or Friday, and letting buyers see it through the weekend, sellers make sure that they give all interested parties enough time to see the home and to make an offer. Often, this strategy results in multiple offers and a higher sales price. But not all sellers wait through the weekend. There are plenty of listings with very few days on market. This contributes to the AVERAGE being 5 days on market. Needless to say, we are in a hot, hot, hot sellers’ market with multiple offers and high sales prices. And looking at the average days on market (DOMM), it is clear to me that more and more buyers are showing up to buy the existing inventory of homes. Have the number of listings increased? On the following table, I have recorded the number of detached homes of between $400k and $600k listed across Fairfax County in the last 90 days. 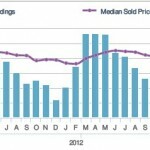 The good news is that it looks like there has been a steady increase in inventory. The not so good news is that the number of listings hasn’t been keeping up with the demand. So, what is this high demand doing to the home prices? Over the past year, we know that the median sold price for all homes in Fairfax County (not just a small sample of detached homes of between $400k and $600k), is up 15.9% from February of 2012. And on a month-to-month comparison (e.g. between January 2013 and February 2013), the median sold price in Fairfax County increased 1.2% from $415,000 to $420,000. However, it is hard to tell in real time what’s happening to home prices because what we are seeing reported in the statistics as sold prices are the prices at the time of contract negotiations (which happened about 30-45 days before the date of settlement). This means that sold home prices reported today have a lag of 30-45 days from when they were originally negotiated. Home prices are up 15.9% compared to February of last year (2012). Home prices are up 1.2% from January to February 2013. Prices being up is the result of a high demand for homes as evidenced by the low Days on Market. What should all these statistics mean to you? Well, if you are planning on selling your home soon, this is very good news. And if you are planning on buying a home, then I can tell you that now is an exciting time to buy; when inventory is at its highest point of the year and there are many homes from where to choose from. In both cases, the trick to having a successful transaction is to be very well prepared to make quick decisions. To know more about how to be well prepared to make quick decisions, contact us! We’ll be happy to get you ready to enjoy Spring in the Fairfax County Real Estate Market.